If you watched the video, you have a good idea about why you want to flush the kidneys. Now, let's dive deeper into the background on the kidneys and explore the extent of the problem in the world today. In addition to cleaning the blood, the kidneys regulate the amount of water contained in the blood. ADH (Vasopressin) is an anti-diuretic hormone produced in the hypothalamus and stored in the pituitary gland. When the amount of salt and other substances in the blood becomes too high, the pituitary glands release ADH into the bloodstream and to the kidneys. This increases the permeability of the walls of the renal tubules, helping to reabsorb more water into the bloodstream. The kidneys also adjust the body's acid-base balance to prevent acidosis and alkalosis. For a full explanation of the anatomy of nephrons and how they work, check outhttp://en.wikipedia.org/wiki/Nephron. Fortunately, it's good to know there are ways to keep your kidneys healthy to avoid going down that road. Goldenrod is used as an aquaretic agent, meaning that it promotes the loss of water from the body (as compared to a diuretic, which promotes the loss of both water and electrolytes such as salt). It is used frequently in Europe to treat urinary tract inflammation and to prevent or treat kidney stones. In fact, goldenrod has received official recognition in Germany for its effectiveness in getting rid of kidney stones, and it is commonly found in teas to help "flush out" kidney stones and stop inflammatory diseases of the urinary tract. Goldenrod is said to wash out bacteria and kidney stones by increasing the flow of urine, and also, soothe inflamed tissues and calm muscle spasms in the urinary tract. It isn't used as a cure in itself, but rather as an adjunct to other, more definitive treatments such as (in the case of bladder infections) antibiotics. Hi Lori, Just click on "Products" above, scroll down on the page, and you can see Jon Barron's list of recommended formulas, and what companies sell them. Thanks! I'm allergic to apples, so is there an alternative you'd recommend to the fresh squeezed apple juice? kidney and liver tests results - not in normal range. GFR - 56. Thank you. Hi where do I buy this stuff you drop into the apple juice? I see a link above but it looks like a pack of items, is it included in that pack? If so which bottle is it in the pack that you mix into apple juice? Thanks! :) ps: I have swelling in my ankles and legs this is a sign of kidney issues , correct? Has this formula eased that issue for anyone ? We list the link in the above comments several times. 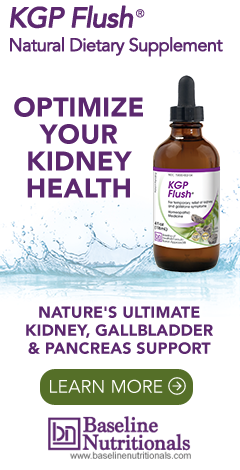 See "Baseline Nutritionals sells a formula like this called KGP Flush™." Baseline Nutritionals also sells two detox "kits" so you have almost everything you need in terms of herbs. Start with the colon detox package. Good luck! Thank you so much for this very informative..... My first kidney stone encounter was last year 4th of July and drove back to the city 4hours away straight to the ER. I didn't know what was going on it felt like I was in labor. LOL my poor husband was driving 90 miles an hour n fire works were going off at the time. What they gave me at the hospital did NOTHING. I googled the following morning about my pain and discovered Chanca Piedra (God Sent)Today is my second attack but good thing I remembered the symptoms from last year. (3 hours later light bulb went off and remembered the Chanca Piedra) It worked within 15minutes of taking it. LOL My daughters dog probably thought I needed an exorcism. LOL Will definitely start detoxing.